Meal prepping is a trend that has recently taken America by storm – and for good reason. 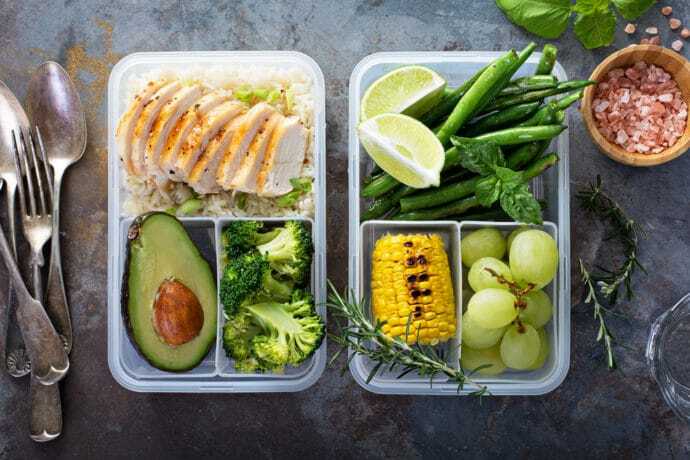 A great way to ensure healthy eating without spending time going to the grocery store or preparing it every day, it’s clear to see why many families are incorporating meal prepping into their weekly routines. Meal prepping is the act of taking one or two recipes, cooking them in bulk, and dividing them up into daily portion sizes to freeze and heat up every day. By creating all of your meals for the week, you no longer have to spend time cooking every day – which also helps you save money by eliminating that ever-present urge to just get takeout instead! Many meal preppers find that establishing a meal plan ahead of time and then choosing a day off from work to pick up the ingredients at the grocery store and prepare all of the meals that day – depending on your work schedule, Sunday and Wednesday seem to be the best days. Once you have cooked all of your food for the week, divide it up into Tupperware containers (make sure they are high-quality enough to withstand a few days in the freezer without freezer burn!) and store in the fridge or freezer, depending on what you cook. Can You Meal Prep on a Budget? Of course! Eating cheaply doesn’t mean breaking out the Ramen Noodles and Easy Mac anymore. In fact, by planning your meals ahead of time, you are able to avoid common money wasters like impulse buying, over-purchasing products, and leftover food waste. Nothing is more frustrating than being in the grocery store wondering if you already have cumin in the pantry at home, or if you need to buy more. Inevitably, it seems, you always make the wrong decision! Apps such as Out of Milk and websites like SuperCook help keep track of what food you already have, and what ingredients you’ll need to pick up from the store. By knowing this information ahead of time, you can also check out local grocery store deals and coupons to further save money. There are certain methods of cooking that can save a lot of time, but you need to be sure you have the right tools to do it! Foods such as stews, casseroles, and soups can produce a lot of food at a relatively low cost, but you need to have either a slow cooker, or a big pot to make large quantities at one time. You’ll most likely need larger pots and pans for the majority of your meal prep cooking, as you’ll be baking in much larger quantities than normal dinners. In addition, it’s always smart to have a meat thermometer in the kitchen to ensure everything is cooked correctly! While it may seem like your kitchen will be destroyed after a day of meal prepping (true, it does get a little messy!) you can always look up ways to minimize the number of dishes you use. Check out this list of 27 healthy recipes you can cook on one sheet pan – delicious and practical! For those who prefer to primarily use crock pots, be sure to use slow cooker liners to make clean-up a breeze. Cook Recipes That Yield A LOT of Food – But Will Stay Fresh! To start putting together a collection of meal prep recipes, start here to find some quick and healthy meal prep recipes to get started! Eastex wants to help you save money any way we can, and meal prepping is just one of the many ways to do so. Another great way to save money is to open up a savings account with us – our three savings plans offer the best options for kids, young adults, and seniors.